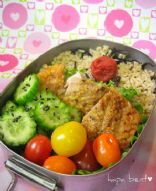 Enjoy this collection of recipes for Bento Box Lunches. The Japanese people know how to stay slim! Here is a brief example of how the low cal healthy "Bento Style" of eating can help you learn a very healthy new way of eating. The secret is Portion Control. The idea is to have several perfectly suited, delicious and very filling single servings of food arranged in a box lunch. As you prepare your boxes, you can see and learn the correct serving and portion sizes for food. This "mini" tutorial will give you ideas on how to assemble your own Bento Box. Healthy chicken "wing" (style) with a sweet teriyaki and fired up kick! Chicken, marinated in home made hoisin sauce and grilled. Nearly 20% of American children from the age of six to eleven, are classified as overweight. Bento may provide solutions for healthier school lunches. The Japanese tradition "Bento" is a Japanese-style lunchbox that has single-portion meal of rice, fish or meat, and one or more pickled or cooked vegetables, usually in a box-shaped container. Bento can be very elaborately arranged in a style called kyaraben or "character bento". Kyaraben is typically decorated to look like popular Japanese cartoon anime characters, characters from comic books or video game characters. Another popular bento style is "oekakiben" or "picture bento", which is decorated to look like people, animals, buildings and monuments, or items such as flowers and plants. Sushi - This Is How I Roll! Wild Game~Take A Bite Off The Wild Side! Dim Sum - Asian Recipes! Home For The Holidays Recipes, Crafts & Gifts! Birthdays and Kids At Heart!